Circa 1890, Hunmanby had three places of Worship apart from All Saints Church. viz. Primitive Methodist Chapel in Prospect Place, Wesleyan Methodist Chapel in Bridlington Street and the Temperance Society in Stonegate. Hence non-conformists worshippers, in total, greatly outnumbered those of the Anglican Church. All villagers for many centuries had been buried in the large churchyard surrounding All Saints Church – re-burials taking place as the churchyard filled up. When the coming of headstone and memorials became popular (for those who could afford them) during the late 18th century and later, it became obvious that the old system of re-burials could no longer take place and therefore, in a large village such as Hunmanby, burial space was getting scarce. By 1890, a large number of burials were non-conformist and this troubled the Anglicans. 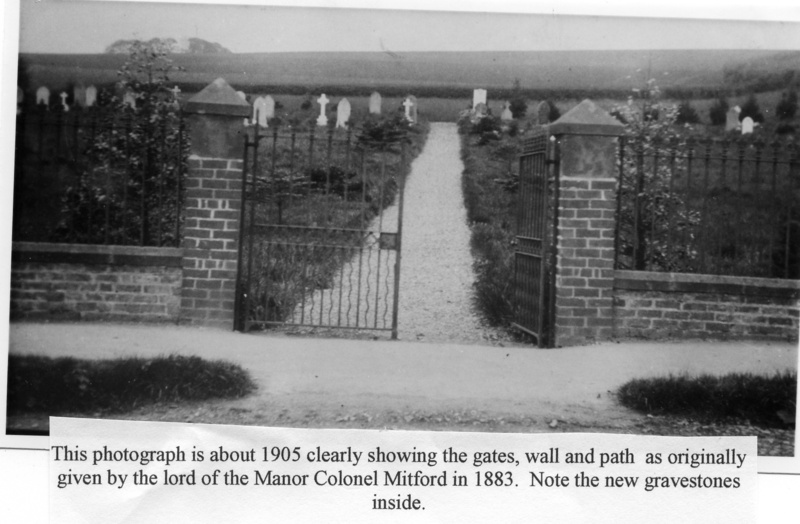 The then new vicar Rev.Edward Mitford (1888-1919) was made aware of this problem and he requested his close relative Colonel Mitford, Lord of the Hunmanby Manor who resided at Mitford Castle, Mitford, Co. Durham, for a suitable plot of Land for use as a cemetery, thus freeing the remaining churchyard for Anglicans. . Colonel Mitford, a fair and good Lord of the Manor immediately gave the village the field in Bridlington Street which borders New Road Hill. Initially the tenant had to be given due notice. Then the estate constructed a central path leading from a gateway in the new brick wall which was provided with railings and a pair of gates. Approximately one acre in area, only the lower three-quarters was used initially. Two conditions were set by Colonel Mitford. Firstly, the new cemetery was for the use of all parishioners – irrespective of their religion or creed. Secondly that no parishioner must ever be barred from burial in consecrated ground for any reason whatsoever and all grave spaces were to be free. God’s Acre cemetery was consecrated in 1893 and the first burial there-in Was:- as per Church Register P.48. No.383. John Taylor of Hunmanby aged 67years. 2nd November 1893. Sometimes called ‘the Chapel cemetery’, God’s Acre grew alongside its Anglican counterpart at All Saints. No cemetery record was kept until my late father (H.C.Mowthorpe Sen. the village undertaker) and ‘Billy’ Dove the local stone-mason set about naming all known graves – purely for their own convenience, in the 1930’s. By this time All Saints grave-yard had filled-up and all Hunmanby burials were taking place in God’s Acre. The last burial in All Saint’s was in 1942, a ‘filling-in’. (1.) In the main, Hunmanby people wished to bury their own loved ones without recourse to ‘money on the rates’. (2.) Rev. Lee proposed the cemetery be named ‘God’s Acre’ because of its religious connotation meaning : ‘A Burial Ground’. (3.) A permanent committee be set up consisting of at least two representatives from ‘All Saints’, Wesleyan and Primitive Methodists and two village members (Parish Councilors perhaps.). Altogether eight adults. (4.) If and when God’s Acre became full, the rear part of All Saints churchyard would be of sufficient age to re-develop. 24th June 1951 saw the first meeting of this full committee. Their first action was to propose and confirm Rev.Lee as Chairman, H.Witty as Secretary and G.Nicholls as Treasurer. By consent of the committee the vicar of Hunmanby always held the Chair. This however was by no means mandatory. Next, it was held that all village supporters be asked for an annual subscription and they were to be known as “FRIENDS OF GOD’S ACRE”. Indeed, the funds have always been held under this title. Banking was done at the (then) Hunmanby branch of Barclays Bank but due to poor interest on current accounts, any surplus was placed in the Trustee Savings Bank in Filey to get a better return. By the time of the second meeting in September 1951 over seventy village families had pledged their support. H.C.Mowthorpe gave the hut and grave-digging implements and was empowered to carry-out all funeral commitments. For other Undertakers he was empowered to make a charge of two guineas. When first opened in 1893, a row of bushes was planted two thirds up from the Bridlington Street entrance. This was to avoid a long up-hill walk to what was the ‘original’ top of the field. Hence the top third was not consecrated during the 1893 consecration. What was originally termed the Chapel cemetery now (by 1930) was referred to as “the cemetery” or “Hunmanby cemetery”. Because of the scores of childrens deaths and miscarriages etc. during the earlier years of this century it was the custom to bury these down either hedge-side, in unmarked plots after a graveside service. For children with marked graves, either side of the central path was utilized. Come 1957, this lower portion of ‘God’s Acre’ was filling-up . Therefore the committee felt that the top third should be prepared. The row of bushes, now quite dense was thinned. Planning permission was obtained for a new vehicular entrance off New Road Hill. This gate, posts, paths and excavation of roadway was presented by H.C.Mowthorpe Junior (Ces.Mowthorpe, writer of this article and the local Undertaker) in memory of the Mowthorpe family interred therein. The new vicar and Chairman (Rev.Couper) arranged for the Consecration of the top third of ‘God’s Acre’ by the Bishop of Hull in 1959. Because Scarborough Crematorium had just opened and cremation became popular, it was agreed that the top two rows, on the left of the new entrance would be used for interred ashes surmounted by memorial stones. During the mid-1980’s Hunmanby Parish Council unexpectedly found it owned a triangle of land adjoining the south-west boundary to God’s Acre. Councillor H.C.Mowthorpe immediately requested this should be offered to God’s Acre at a peppercorn rent for future extension. This was agreed and Planning Permission, fencing etc was carried-out under the Chairmanship of the Rev.C.Whitehead. This new extension was Consecration by the Bishop of Hull on 29th May 1990. It is worth noting that the writer of this, H.C.Mowthorpe (Jun.) – the local Undertaker – has personally buried three (3) Atheiests/Agnostics, who were local parishioners at the time of their deaths, in God’s Acre. Each burial was with the full knowledge of the Vicar (Chairman) and the Methodist Minister. Originally it was possible to purchase the ‘right to bury’ in an adjoining grave space for the sum of £10.00 – known as ‘a faculty’, provided that the space was bounded by a stone kerb. Rev. Lee stopped this practice, permanently, in 1955. Whilst originally no charges were made except for the grave-digger, the present cost of upkeep has meant that for normal interments, the current rate of Church Burial charges as set by the Diocesan, is deemed proper although the committee always try to keep these somewhat lower, as a ‘perk’ for parishioners. If any distress is caused to a village family by this arrangement, at the discretion of the committee, these charges will be waived. 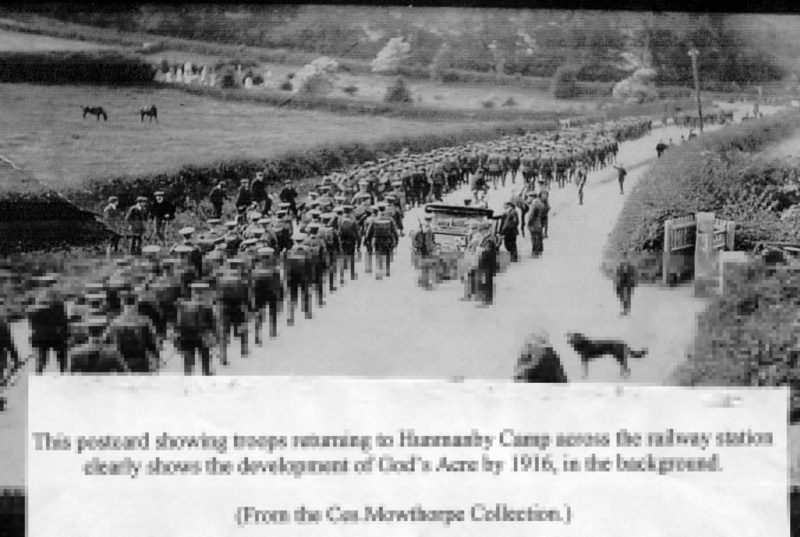 “Villagers” who have resided outside Hunmanby for some time but have a long-standing connection with the village, may, at the discretion of the committee , be buried in ‘God’s Acre’. Until the late 1990’s this burial ground had been formally run from 1955 by it’s committee. However, the Treasurer (myself) felt that it was time to make it a Registered Charity under the Charities Commission so this was agreed by the committee and this was undertaken by Messrs. Thorpe. Solicitors. Belle Vue Street, Filey. Senior Solicitor Mr Barry Newton’s own family are buried in ‘God’s Acre’ and he undertook the task at a reasonable fee. It meant purchasing the triangle of ground mentioned above from the Parish Council but this was no problem so it was purchased for £1.00. During this purchase it was discovered that there was no legal deed appertaining to the God’s Acre site. During the selling of the Hunmanby Estate in 1921, as no change of ownership was involved, so no deed had been drawn-up. This was remedied but at considerable expense ! Subsequently the said triangle of land was consecrated in 1990 and burials undertaken shortly afterwards. It was also decided that the Chairmanship of the committee would alternate every two years between the Vicar and resident Minister but could be amended if required. The savings account which was still with the Trustee Savings Bank was changed to the Skipton Building Society in order to obtain better interest. Extra funds are raised each year by a Jumble sale, and Coffee mornings whilst generous donations are given by those whose family rest therein. Special mention must be made of people who have given much of their time and effort in maintaining God’s Acre. These include the late Mr & Mrs Frank Maltby, Mr & Mrs Peter Mason and son Rob. The Hammond family. Relatives of the Parker family. Miss Sheila Spink and Mrs Edna Bates plus a number of ‘Friends’ that wish to remain anonymous. All have members of their families interred in this unique cemetery.